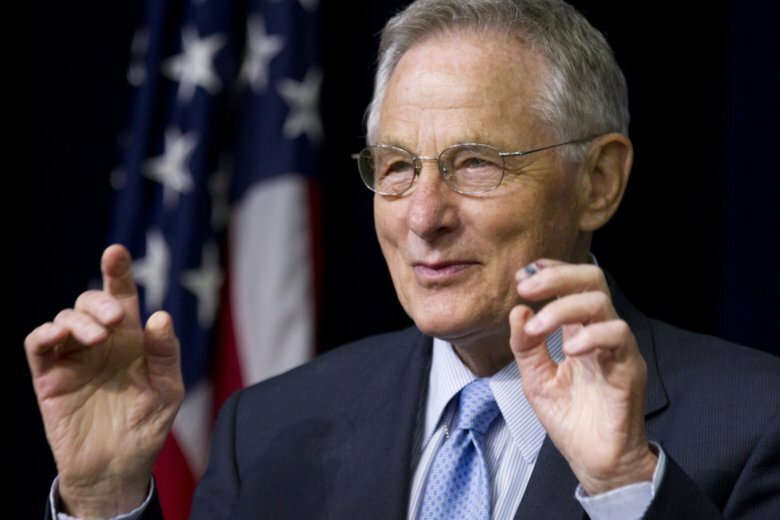 INDIANAPOLIS (AP) — Former U.S. Sen. Birch Bayh, who championed the Title IX federal law banning discrimination against women in college admissions and sports, died at his home Thursday at age 91. Bayh was surrounded by family at his home in Easton, Maryland, when he died shortly after midnight from pneumonia, his family said in a statement. His son, Evan, followed him into politics and became Indiana’s governor and a senator. The liberal Democrat had a back-slapping, humorous campaigning style that helped him win three narrow elections to the Senate starting in 1962, at a time when Republicans won Indiana in four of the five presidential elections. Bayh’s hold on the seat ended with a loss to Dan Quayle during the 1980 Ronald Reagan-led Republican landslide. Bayh (pronounced “by”) sponsored a constitutional amendment lowering the voting age to 18 amid protests over the Vietnam War and another amendment allowing the replacement of vice presidents. But it was his work to pass the landmark Title IX law that solidified his legacy. He wrote and was the lead sponsor of the 1972 law, which prohibits gender discrimination in education — known as Title IX for its section in the Higher Education Act. The law’s passage came at a time when women earned fewer than 10 percent of all medical and law degrees, and fewer than 300,000 high school girls — one in 27 — played sports. Now, women make up more than half of those receiving bachelor’s and graduate degrees, and more than 3 million high school girls — one in two — play sports. Bayh said the law was aimed at giving women a better shot at higher-paying jobs, and he continued speaking in support of Title IX’s enforcement for years after leaving Congress. “You simply cannot look at the evolution of equality in our nation without acknowledging the contributions and the commitment Senator Bayh made to securing equal rights and opportunities for every American,” King said. Bayh also used his position as head of the Senate’s constitutional subcommittee to craft the 25th Amendment on presidential succession and the 26th Amendment setting the national voting age at 18. The issue of presidential succession was fresh when Congress approved the amendment in 1967. The vice presidency had been vacant for more than a year after President John F. Kennedy’s assassination because there was no provision for filling the office between elections. The amendment led to the presidency of Gerald Ford less than a decade later when Ford first succeeded Spiro Agnew as vice president and then took over the White House after President Richard Nixon’s resignation during the Watergate scandal. Bayh’s push to lower the national voting age from 21 to 18 came amid protests over the Vietnam War and objections that Americans dying on battlefields were unable to vote in all states. The amendment won ratification from the states in 1971. Bayh also was a leading sponsor of the Equal Rights Amendment, which would have barred discrimination on the basis of gender. It passed Congress but failed to win approval from two-thirds of the states by its 1982 deadline. Bayh had begun preparing to make a run for the 1972 Democratic presidential nomination when his first wife, Marvella, was diagnosed with breast cancer. He dropped that campaign but entered the 1976 presidential campaign, finishing second to Jimmy Carter in the opening Iowa caucuses but then faring poorly in later primaries. Marvella Bayh gained attention by speaking and making television appearances around the country promoting cancer detection and encouraging research. But her cancer later returned, and she died in April 1979 at age 46, shortly before her memoir recounting her health fight was published. Bayh sought a fourth Senate term the following year — with their 24-year-old son Evan as campaign manager — but lost to Quayle, then a two-term congressman. Born on Jan. 22, 1928, in Terre Haute, Indiana, Birch Evans Bayh Jr. moved to his maternal grandparents’ farm at the nearby community of Shirkieville after his mother’s 1940 death and his father’s entry into World War II military service. He graduated from Purdue University’s School of Agriculture after spending two years in the Army and met his future wife during a 1951 National Farm Bureau speaking contest in Chicago, which she won as an entrant from Oklahoma. They soon married and moved to the Shirkieville farm. Bayh won his first election to the state Legislature in 1954; his son Evan was born the following year. Bayh rose quickly in politics, becoming the Indiana House speaker in 1959 at the age of 30. He earned a law degree from Indiana University, completing law school while serving in the Legislature. Bayh was 34 when elected to the Senate and soon became friends with the only senator younger than him: Massachusetts Sen. Edward Kennedy. Bayh and his wife were flying with Kennedy when their small plane crashed near Springfield, Massachusetts, in June 1964. The pilot and a legislative aide were killed, but Bayh pulled Kennedy, who suffered a broken back and other serious injuries, from the wreckage. After leaving the Senate, Bayh worked as a lawyer and lobbyist in Washington. He remarried in 1982, and he and wife Katherine “Kitty” Helpin had a son, Christopher, who is now a lawyer in Washington. Bayh largely stayed in the background of Indiana politics as his older son, Evan, was elected to the first of his two terms as governor in 1988. The younger Bayh built a more moderate image than his father, ending his eight years as governor with a high approval rating and then winning his first of two elections to the Senate in 1998. He didn’t seek a third term in 2010, saying the Senate had become too partisan. Evan Bayh launched an unexpected comeback bid in 2016 for the Senate, but he lost to Republican Todd Young. The elder Bayh seemed to revel in the change brought about from the Title IX law, describing it as the most important legal step for equality since the right of women to vote was guaranteed by the 19th Amendment in 1920. Bayh is survived by his wife Kitty, sons Evan and Christopher, and four grandchildren.